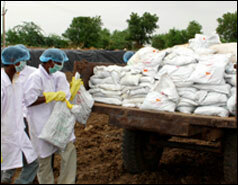 In June 2008 there was accidental oil spill near city of Gujarat (Western India) due to crude oil trunk line rapture. Crude oil was spread in large area in farm land. However, land was vacant, thus there was not much loss of crops. This trunk pipeline was being used for transportation of crude oil from oil producing field to the Gujarat Refinery in Baroda City of India. Oil producing company took immediate action and stop pumping of crude oil in affected trunk line. Oil Company also immediately barricaded the oil spill site and also prevented the spread of crude oil. The Oil company recovered substantial amount of crude oil accumulated in low lying area at spill site. After these primary actions by Oil Company themselves, they approached ONGC TERI Biotech Ltd which is joint venture company between ONGC and TERI (New Delhi, India), www.otbl.co.in. OTBL crew members reached the oil spill site and did the assessment of oil spill. 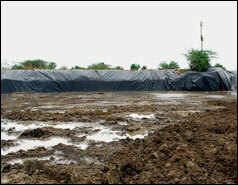 After assessment of volume of oil soaked soil OTBL constructed a secured bioremediation pit fitted with HDPE liner. OTBL engaged a team to excavate the entire oil soaked soil. Entire oil soaked soil was excavated by using mechanical excavator and then it was transported to the bioremediation site by using soil dumpers. OTBL had carried out the excavation of 14694 m3 of oil contaminated soil and transported the same to a secured bioremediation pit fitted with HDPE liners and after excavation the excavated site was refilled with good fertile agriculture soil. After dumping of oil soaked soil in secured bioremediation pit, Oilzapper (crude oil degrading bacterial consortium) was applied for degradation of TPH in oil contaminated soil. Oilzapper is a consortium of crude oil degrading bacterial consortium developed by assemble of four species of oil degrading bacteria which could degrade different fraction of TPH. Oilzapper was produced in bulk and converted into powder form. After application of Oilzapper (74.5 tonnes) nutrient recipe was also sprayed on oil soaked soil and then tilling of oil soaked soil was done at regular intervals. Samples were collected from bioremediation site and tested in the laboratory to monitor the rate of degradation of TPH in oil soaked soil. Ex situ bioremediation of oil soaked soil by application of Oilzapper (oil degrading microbes) is shown in Figure 1, 2 and 3. After completion of bioremediation (TPH reduced to 5000 ppm), toxicity of bioremediated soil was done in laboratory approved by Ministry of Environment and Forest, Government of India. After fish toxicity test bioremediated soil is used in green belt development. The result of bioremediation of oil contaminated soil is given below. 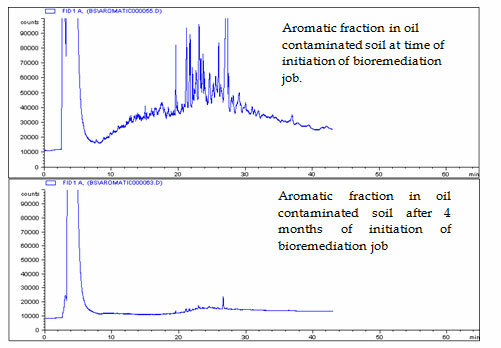 At zero day (at time of start of bioremediation job) oil content in oil soaked soil was 14.50% and it reduced to 7.31% after two months of initiation of bioremediation. 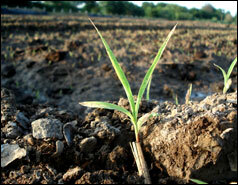 Oil content in oil soaked soil was further reduced to 3.12% after three month and 1.70% after 3.5 months. After 4 months oil content is same soil was reduced to 0.58% (5800 ppm) as shown in Figure 4. Degradation of different fraction of TPH was also monitored. 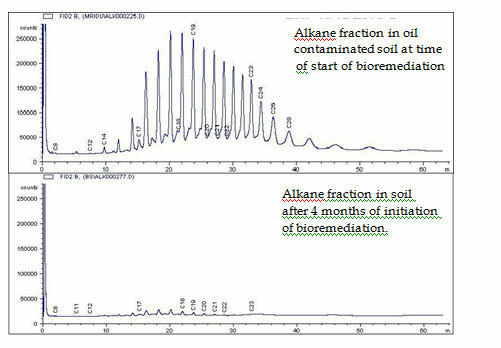 As shown in Figure 5 that most of alkane fraction were degraded in oil soaked soil in four months. Similarly aromatic fraction was also degraded in soaked soil in four months (Figure 6). After testing of level of oil content in oil soaked soil at bioremediation sites, fish toxicity of oil soaked soil was also tested. The fish toxicity test result revealed that in control soil (where only tilling was done) fish could not survive while in bioremediated soil fishes survived. This study revealed that bioremediation of oil spill, oil soaked soil is mot environment friendly and cost effective as compared to other treatment methods. Bioremediation of oil spill in large area is possible. 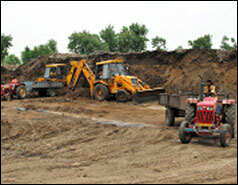 OTBL has been providing services on Bioremediation of oil spill sites on turnkey basis to major oil companies in India. 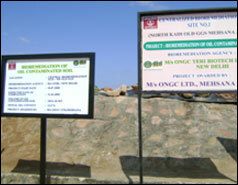 OTBL has developed site specific oil degrading bacteria for bioremediation process. OTBL has also developed specific microbes for bioremediation of oil spill sites in KOC oil field. These microbes are origin of Kuwait and could survive and work in Kuwait climatic and soil conditions (high temperature in summer and high salinity around 7% salt). These specific microbes known as KT Oilzapper was tested in pilot scale for bioremediation of oil contaminated sites (dry and wet tar crit area) in KOC oil field. With application of KT Oilzapper and specific nutrient recipe, oil contaminated site was completely clean and after that same site was restored and converted into green cover. 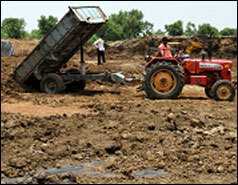 Figure 2: Restoration, Excavation and Refilling of oil spill site at Mehsana, Gujarat. 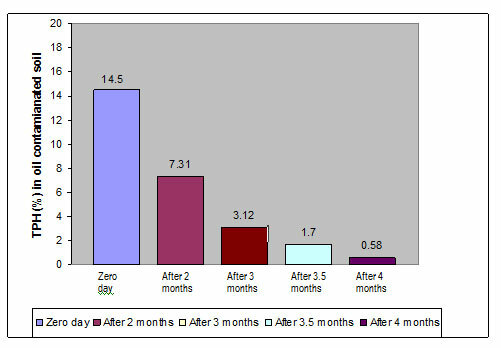 Figure 4: TPH (%) in the oil contaminated soil undertaken for bioremediation at secured bioremediation site situated at North Kadi, Gujarat.